It’s two years now since I posted my first post on this blog! Through blogging, I became a much more skilled and knowledgeable cook. I learnt about various food cultures and inspirational eating habits. I’ve come to know, virtually and in reality, many other amazing bloggers. And I have been part of wonderful food events. Thank you all for your LIKES and SHARES and COMMENTS. And mostly thank you for keeping coming back you’ve been a great support to me. 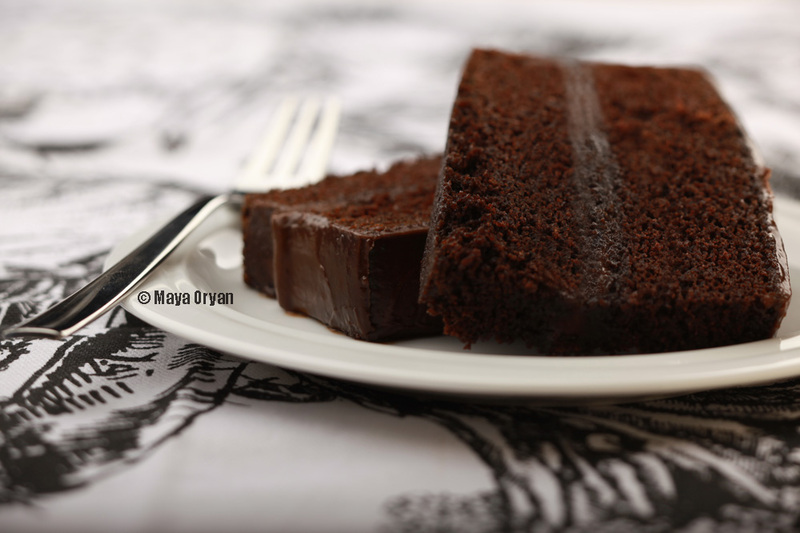 Can’t wait to eat a piece of the cake, it’s one of my favorite chocolate cakes recipes. 1. Preheat oven to 180 degrees Celsius / 350 degrees Fahrenheit. Butter and flour two 9-inch round cake pans. 2. Sift together the cake flour, baking powder, baking soda and salt into a medium bowl; set aside. In a small bowl, whisk together cocoa powder and hot water. 3. In a large bowl, using a hand mixer or stand mixer, beat butter and sugar together until light and fluffy, about three minutes. Beat in eggs, one at a time, then beat in vanilla and cocoa powder mixture, scraping down the bowl with a spatula as you go. Add one third of the flour mixture to the butter mixture, beat well, then beat in half of the buttermilk. Beat in another third of flour mixture, then second half of buttermilk. End with the last third of the flour mixture, beat until well combined, making sure to scrape down the bowl with a spatula. 4. Divide batter evenly between the cake pans and place them in the preheated oven. Bake for 25-30 minutes. Check early, cake is done when a toothpick inserted in the center comes out clean. 5. Cool the cakes in their pans on a wire rack for 10 minutes. Remove the cakes from the pan, and allow to cool completely before frosting. 1.Whisk together cocoa powder and hot water until smooth. 2. With an electric mixer, beat butter, sugar and salt on medium-high speed. 3. Reduce heat and slowly add melted chocolate and cocoa powder mixture. Mix until well combined. This entry was posted in Articles, Desserts, Recipes and tagged Blog anniversary, Blogaversary, cakes, Chocolate cake, Chocolate frosting, desserts, Devil's Food Cake, Food Blogger, food photography, Food Styling, Food Stylist, lebanese food blogger, Maya Oryan, Mayas Ingredients, Snayniyeh, Treats, Two layers cake by Maya Oryan. Bookmark the permalink. Congrats on your 2nd candle! Happy blogging in the future!! Fantastic and a fitting cake for the celebration. Congrats! Congratulations. I hope I’m still blogging after two years. Enjoy your cake. It looks delicious. Congats! The cake looks celebration-worthy! Happy Birthday & the cake looks delicious! Congratulations on your blog anniversary! I just passed my first year. There are times that I wonder if I will or can continue…but I find it to be such a healing and creative outlet…don’t you? Congrats…hope I make it that long! Happy anniversary! Can you tell I’m behind in reading blogs??? The cake looks suitably devilish. Happy Bloggerersary and that cake looks to die for!